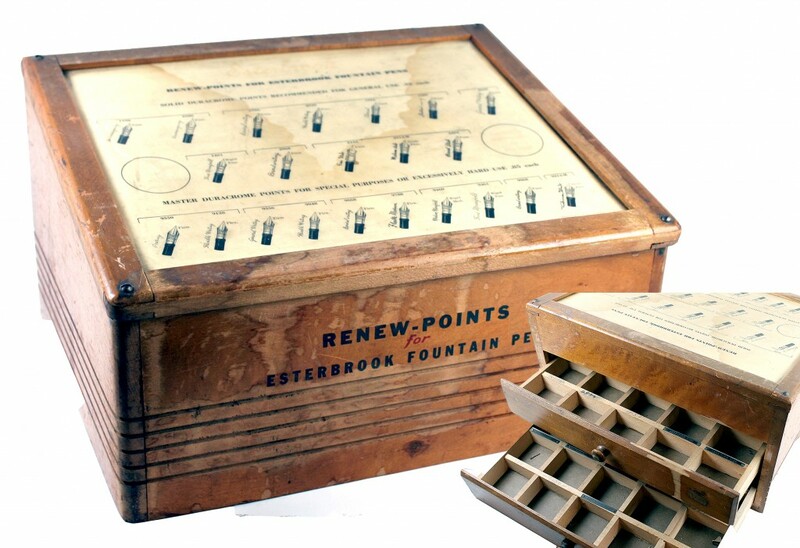 Now in the vintage pens category, Esterbrook’s interchangeable nib system was so great because it offered users the ability to have just one or two pens, and a huge variety of nibs. There were dozens of different nibs, each with its own number and name, that we could wonder how on earth a retailer could keep them all organized and easily available for sale. Esterbrook developed systems for this, of course, one of which is shown below. I very much enjoy the organization, especially the wooden boxes and chests which house the tidy little drawers. The top of the chest below has images and descriptions of the nibs and is ideal for the customer who wants to browse, or for the sales person who needs to find just the right nib unit! How many different Esterbrook nibs were available? The Renew points were available in 33 nibs.